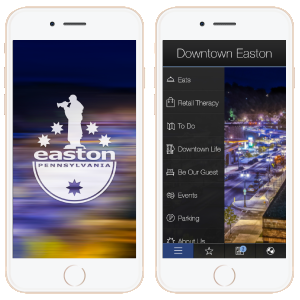 The Downtown Easton app is your connection to all things downtown! Now available as a free download for iPhone and Android, the app caters to downtown visitors and local residents. In the app you’ll find a complete listing of downtown businesses. Whether dining out or shopping for something special, you’ll find those listings along side local service businesses, attractions and museums. Also check out the downtown event listings, travel accommodations and important parking information. Find it in the iTunes or Google Play app stores today!